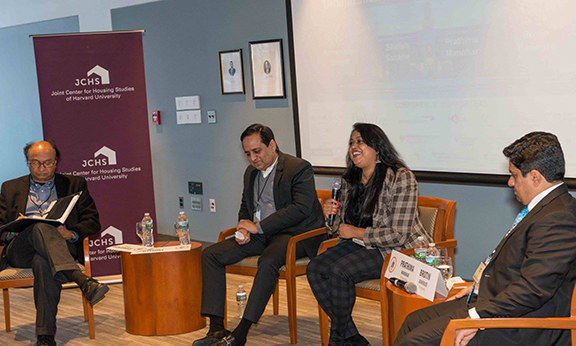 “Urbanization as a Growth Strategy for India” was the focus of a panel discussion on Saturday, February 6 at the India Conference at Harvard University, the largest student-run conference focusing on India held in the United States. (The Joint Center was one of the event’s co-sponsors.) As one of the most populous countries in the world, the policy decisions and investment choices that are made in India will have a resonance beyond its borders in terms of environmental impact and quality of life for one of the largest and fastest growing markets in the world. Panelists at the conference, who noted that India’s urban population is expected to grow significantly in coming decades, focused on a variety of topics including the role that urban areas can play in the country’s economy and the many challenges to achieving that goal. Shirish Sankhe, Director of the Mumbai office of McKinsey & Co. opened by citing the 2010 McKinsey Global Institute report, India’s urban awakening: Building inclusive cities, sustaining economic growth, which estimates that India’s working age population will grow by nearly 270 million people by 2030 (from about 800 million to over 1 billion). The growth will be urban, he said, noting that by 2030 at least 10 of India’s 29 states will be more than 50 percent urbanized. (Currently, only two relatively small states are urbanized.) Moreover, McKinsey projects a five-fold increase in GDP. Accommodating this growth will be a major challenge, he conceded, because 25 percent of the urban population of India lives in slums and the country only invests $17 per capita per year in infrastructure, about an eighth of what McKinsey estimated was needed. Illustratively, because the country has underinvested in transportation, the share of people using public transportation is estimated to have dropped in recent years from 50 percent to 30 percent. Moreover, there is a significant lack of public understanding about administrative practices and the role of various organizations involved in city and state governance, which not only makes public participation challenging but complicates the entire planning process. Prathima Manohar, an architect and founder of The Urban Vision, an urbanism “think do-tank;” asserted that another key challenge is that the leaders of India’s cities seem to be fixated on strategies that more developed parts of the world are moving away from, such as auto-centric development and over-consumption of resources. Despite the creative brilliance and skilled human capital in India’s cities, she added, there is a lack of civic and recreational space that would improve residents’ quality of life. However, she also said there are an increasing number of grassroots organizations working to improve urban environments. She also predicts that the success of these smaller enterprises will be paramount to improving livability of the cities. Brotin Banerjee, CEO of Tata Housing, noted that the lack of affordable housing options is a problem that has plagued Indian cities for decades. Given the scale of the problem, he said it would take efforts from various sectors in order to make a difference. Tata Housing is spearheading this effort from the private sector, by investing in construction that provides homeownership options for the low- and middle-income urban residents. The challenge in doing this, he added, is devising models that are scalable and profitable, particularly when new projects must also provide supportive infrastructure such as water and sewer connections as well as roadways, which are typically the public sector’s responsibility. Despite their diverse backgrounds, the panelists agreed that given the scale and interdependence of the urban problems in India, the prevalent expectation that the public sector should solve all the urban problems is unreasonable and likely detrimental. Instead, they agreed that there needs to be – and there seems to be – growing coordination between the public and private sector, and there is a significant role for grassroots organizations to play. In discussions moderated by Bish Sanyal, Ford International Professor of Urban Development and Planning and Director of the Special Program in Urban and Regional Studies at MIT, the panelists highlighted a host of approaches and practices that, in their opinion, seem to be working. Shirish Sankhe noted that funding allocation methods based on competitive grounds, like the one being used for development of ‘smart cities,’ seems to be a successful model. These are small to medium size cities competing for federal fund to spur infrastructure development and the selection is based on certain predefined design criteria. Along similar lines, he noted, there is a movement towards a performance management system of city governance. In this approach, India’s cities are ranked on various criteria which then puts pressure on the elected officials to perform and be more accountable to the public. Highlighting some of the positives surrounding the development of “greenfield” sites, he added that anticipation of transportation needs and how those are likely to evolve over time has become an integral part of planning. In the context of building more affordable housing, Brotin Banerjee noted that some of the policy solutions in recent times have revolved around making construction and green construction more cost effective by providing flexibility around height limitations and FAR regulations. He also added that perhaps the best form of public-private partnership would be talent sharing. In response to questions from the audience about the segregation patterns that have or could emerge based on racial and cultural lines, the panelists agreed that Indian cities need to move away from identity based politics in order to avoid increased segregation and to build more inclusive cities.